Wood mallet, made in Camp Petawawa, 1940-1942. Comprised of two to three wood pieces, including the handle, the head, and a possible plug to secure the handle to the head. Resin or glue is visible and was likely used to secure the handle to the head. The head is comprised of a small branch (2.75 inches long) with a diameter of 2 inches. The exterior bark remains in place. The mallet appears to be roughly finished. As a result, it may have had a utilitarian purpose and actually been used in wood working. 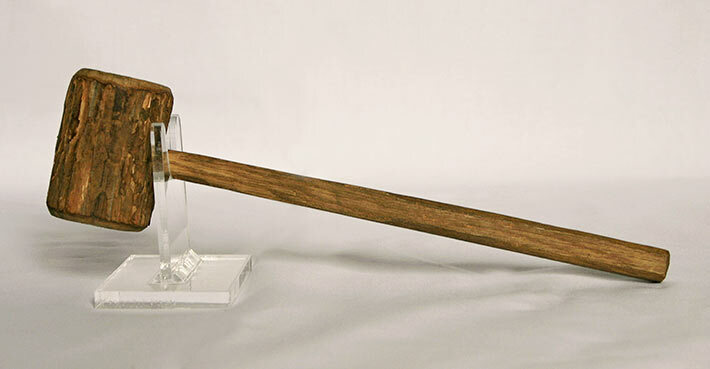 This mallet is part of a group of wood objects collected and preserved by the family of internee Girolamo (George) Capponi. The mallet along with other wooden objects in the collection, may have been made by Capponi himself. He had written to his wife asking for wood-working tools.